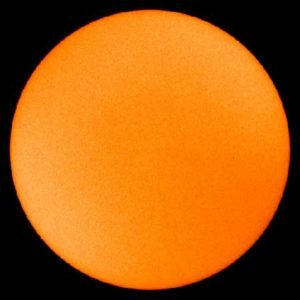 There are a lot of questions about the current solar minimum, which has reached historic levels—“No solar physicist alive today has experienced a minimum this deep or this long,’’ according to NASA’s Madhulika Guhathakurta, lead program scientist for NASA’s Living With A Star program, which studies solar variability and its effects on Earth. Some of the effects of the minimum are fairly clear to scientists: the amount of cosmic rays entering our portion of the solar system is greater than normal, and Earth’s ionosphere has shrunk. The solar minimum at an extreme: a spotless sun on July 1, 2008. The debate is instead partly about the effect of the minimum on Earth’s climate. A recent study by Judith Lean of the Naval Research Lab and David Rind of NASA’s Goddard Institute for Space Studies suggests that decreased solar irradiance during the current minimum cycle may be slightly offsetting recent warming attributed to greenhouse gases. Even if the minimum is affecting climate, it may be of minimal consequence. Just as importantly, the solar minimum won’t last forever, so any climatic effects are temporary, as well. But when will solar activity turn around? The current minimum began in 2000 and has been particularly deep for the last two years. At the AMS Annual Meeting, Joseph Kunches of NOAA’s Space Weather Prediction Center attempts to pinpoint the arrival of the next solar maximum and ponders its potential effects in his presentation, “Solar Cycle Update—Will the New Cycle Please Start?” (Monday, 2:15–2:30 p.m., B303). And Matthew J. Niznik and W. F. Denig of the National Environmental Satellite, Data, and Information Service introduce a new indicator, the Genesis Minimum Quiet Day Index, which analyzes sunspot activity and suggests that the current solar minimum is not anomalous. Their index and the larger topic of the influence of solar activity on Earth’s climate are explored in their poster, “Impacts of Extended Periods of Low Solar Activity on Climate” (Monday, 2:30–4:00 p.m., exhibit hall B2). With the very obvious concerns expressed by many of our leading solar scientest about the severity of the coming maximum. Will it not be prudent for the scientific community to wake up the political community as to the consequences of a lack of concern on everyone for what may be coming our way. Very little about this is being covered in the media. As I go about my day to day life I find that few people are even aware that something may be wrong on the sun’s surface. Just Asking.